It's the end of another day and my foodie colleague decided that we take a 2km walk from the office to this little Muslim restaurant. We had to deliberately set off after 8pm to avoid the dinner crowd as this restaurant is very popular. Here's the strange thing. This Muslim restaurant serves alcohol and I have picture to prove it. (See right). Apparently, Muslim restaurants in the Capital are allowed to serve alcohol and so I assume Muslims here can drink alcohol. I was glad to have visited this restaurant as the food was very yummy. That's a plate of lamb murtabak, on the right, and unlike our Singapore version where pieces of lamb are sprinkled across the dough, this version is an entire layer of minced lamb spread right to the edges ala filling in a lasagna. We ordered a few dishes but I took pictures of two other that I feel worth honourable mention. 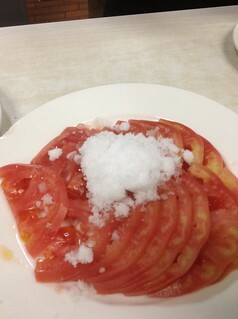 The first is sliced tomato and white sugar. The taste was so-so and it was unfortunate that I wasn't able to get the crunchy texture from the sugar ala Sugar Butter Toast as they were all dissolved by the time we can even get the chopsticks near it. Well, I ordered it as the dinner was rather heavy on meat and I thought I'd order some vegetables to balance the meal. I also ordered a cold tofu dish but that was just very ordinary that I felt no need to show a picture here. It's your normal cold tofu that instead of soy sauce to taste, they added their own white vinegar recipe and spring onions. The above was the highlight of the evening. 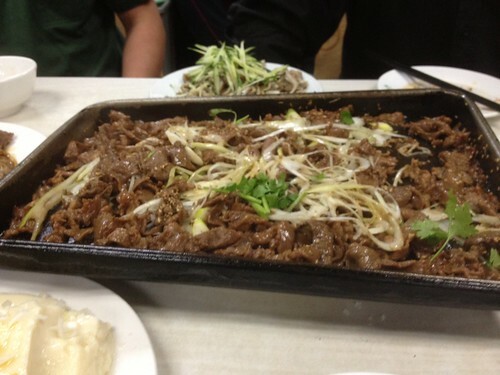 Hotplate Lamb. Very well marinated, tasty and very generous with the spring onions and coriander leaves. We also asked for raw garlic to munch in between morsels of this awesome dish. It goes very well with beer. 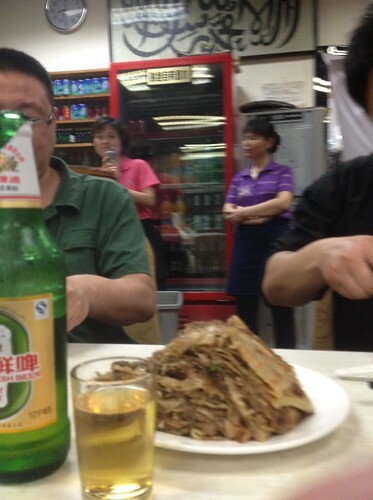 Beer was RMB 6.00 (SGD 1.20) per 600ml bottle. Dirt cheap. One thing is for sure, these are not fake beers as it would have cost more to counterfeit. Feel safe and drink away! Speaking of drinking away, the table next to us got drunk and kicked up a ruckus. Beer bottles were smashed and an unfortunate fragment of beer bottle glass flew in our direction catching my manager's leg. Blood. Ouch. But nothing a plaster cannot fix as we continued to eat ignoring the drunken 4. It was a very eventful evening as the whole restaurant then blacked-out shortly after and I had to settle the bill with the help of the illuminated display panel of the waitress' mobile phone. We were welcomed by thunder, lightning and rain as we stepped out of the restaurant, into the darkness of a cool breezy night. Anonymous: Very nice! But somehow I still prefer our local version, probably because of the peanut sauce. Dammit.... and I thot I found a loophole there. Hahaha.